Promo 101 Virtual Blog Tours has a few more exciting stops planned for the end of November. While you let your Thanksgiving dinner settle, stop by Book Hookup http://bookhookup.blogspot.com/2008/11/conor-and-crossworlds-book-one-breaking.html to read a review of book one in author Kevin Gerard’s exciting young adult fantasy series: Conor and the Crossworlds. On Friday, November 28, stop by again to catch the review of book two: Peril in the Corridors. While you’re there leave a comment and you’ll have a chance to win a copy of one of his books. It could make a great Christmas gift! 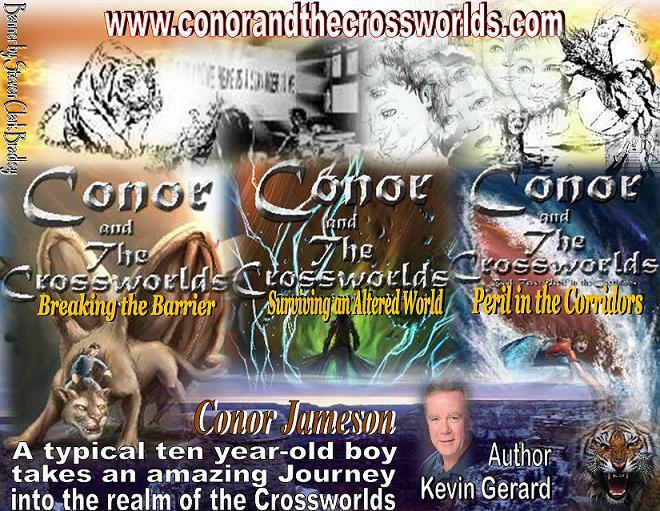 Visit Kevin’s website http://www.conorandthecrossworlds.com where you can download a free Conor and the Crossworlds ebook and keep tabs on the upcoming release of Surviving an Altered World which is due out in December. In it Conor and Janine watch in horror as a powerful warrior sent by the Circle of Evil destroys their world and imprisons everyone they know. The Lady of the Light explains that she and her kind deposited the five keys of the creators on different worlds just before the chaos began. If Conor and Janine can recover the keys, the Crossworlds will be restored. Join in the hunt for the keys by clicking on the contest video on his website to learn the exciting details regarding The Hunt for the Five Keys of the Creators. The contest begins in January. For more information on Kevin Gerard, visit his website http://www.conorandthecrossworlds.com. Take a moment to stop by and post a comment to these two authors for a chance to win a copy of their book. It could make a great Christmas gift! Read an excerpt from author Kevin Gerard’s Conor and the Crossworlds series at Angela Verdenius’ blog http://www.myspace.com/angelaverdenius. Also learn more about joining in the hunt for the keys by clicking on the contest video on his website to learn the exciting details regarding The Hunt for the Five Keys of the Creators. The contest begins in January. And be sure to check out what Tony Napoli has to share on Before I Was Published http://beforeiwaspublished.blogspot.com/. Learn about his life growing up as the son of one of the most powerful and respected organized crime leaders of the modern era. Tony’s father was Genovese Family Capo, James “Jimmy Nap” Napoli—a mob kingpin who ruled over the largest gambling empire in America for almost 40 years. Author Kevin Gerard discusses the writing process and his young adult fantasy series Conor and the Crossworlds at Queen of Convolution http://cfvici.blogspot.com. Stop by and ask a question or leave a comment for a chance to win a copy of one of his books. Also learn more about joining in the hunt for the keys by clicking on the contest video on his website to learn the exciting details regarding The Hunt for the Five Keys of the Creators. The contest begins in January. Tony Napoli author of My Father, My Don will be interviewed at The Book Connection Interview http://www.thebookconnectionccm.blogspot.com/. Tony “Tony Nap” Napoli is the son of one of the most powerful and respected organized crime leaders of the modern era. Tony’s father was Genovese Family Capo, James “Jimmy Nap” Napoli—a mob kingpin who ruled over the largest gambling empire in America for almost 40 years. We’ve got an exciting tour lined up this month with Kevin Gerard, author of the Conor and the Crosswords series. Visit Kevin’s website http://www.conorandthecrossworlds.com where you can download a free Conor and the Crossworlds ebook and keep tabs on the upcoming release of Surviving an Altered World which is due out in December. In it Conor and Janine watch in horror as a powerful warrior sent by the Circle of Evil destroys their world and imprisons everyone they know. The Lady of the Light explains that she and her kind deposited the five keys of the creators on different worlds just before the chaos began. If Conor and Janine can recover the keys, the Crossworlds will be restored. On November 3, whet your appetite with an inside look at Kevin Gerard’s life as a writer at Teens Read Too http://www.teensreadtoo.com/BookReviews.html with a bonus of an excerpt from his book. And November 5, don’t miss Great New Books Reviewed http://newgreatbooks.blogspot.com as they host Kevin. Read more about what Kevin has to say about being a science fiction/fantasy writer. November 7th learn more about the Crosswords at It’s All In the Setting http://itsallinthesetting.blogspot.com. We’ve got an exciting tour lined up this month with Kevin Gerard, author of the Conor and the Crosswords series. This riveting series opens with book one, Breaking the Barrier, in which Conor unconsciously calls forth the power of the Crossworlds creators following the death of a favorite uncle. They send the mystical beast, Purugama, to accompany Conor on a fantastic journey of discovery. In book two, Peril in the Corridors, Conor finds himself transported to the Glade of Champions, where he meets Maya, Eha, Ajur, Surmitang, and mighty Therion, all Champions of the Crossworlds. After learning about his mission, Conor departs with Maya to do battle with the warriors of the Circle of Evil, experiencing wondrous and terrifying surprises at every stop on his amazing journey. 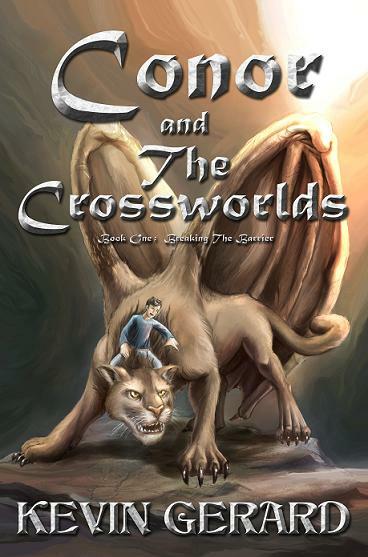 Visit Kevin’s website http://www.conorandthecrossworlds.com where you can download a free Conor and the Crossworlds ebook and keep tabs on the upcoming release of Surviving an Altered World which is due out in December. In it Conor and Janine watch in horror as a powerful warrior sent by the Circle of Evil destroys their world and imprisons everyone they know, including the Crossworlds Champions and the creators. The Lady of the Light appears, explaining that she and her kind deposited the five keys of the creators on different worlds just before the chaos began. If Conor and Janine can recover the keys, the Crossworlds will be restored. You can join in the hunt for the keys by clicking on the contest video on his website to learn the exciting details regarding The Hunt for the Five Keys of the Creators. The contest begins in January. And don’t miss Great New Books Reviewed http://newgreatbooks.blogspot.com as they host Kevin on November 5 and read more about what Kevin has to say about being a science fiction/fantasy writer.